Photo: Hiking near Tham Lot, Soppong. Tham Lod is one of Thailand’s most impressive and easily accessible caves, partly for its size, partly for its attractive limestone stalactite formations and partly for an unusual coffin cave hidden within the main cave. Browse places to stay in Soppong on Agoda.com. Free cancellation. In its entirety, Tham Lod is more than 1.5 kilometres long, still considerably smaller than some other caves in the area, but the main chamber is spectacular, running to a height of 50 metres, from floor to ceiling. The Lang river flows through more than a third of the cave’s length, giving you an opportunity to float through on bamboo rafts. Floating along in the darkness, listening to and smelling the bats overhead, makes for a special experience. 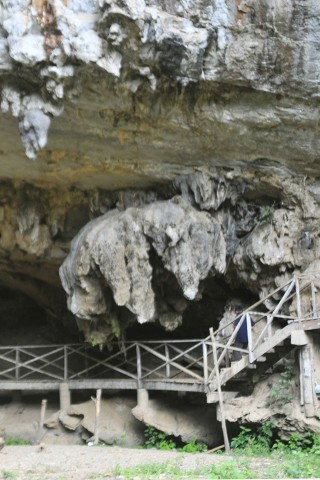 A typical visit includes a raft trip through some of the cave followed by a climb through other sections to visit the coffin cave and a couple of other stalactite chambers, but accessibility and therefore programmes vary considerably according to water levels. At certain times of year Cave Lodge offer an exciting kayaking trip through the cave; certain chambers may not be accessible during rainy season. A complete visit should take about two hours depending on your pace. Try to time your visit around late afternoon as at dusk hundreds of thousands of bats fly out of the cave and equal numbers of swifts fly in. This spectacle can be viewed at the exit to the cave and has to be seen to be believed. The cave is down a short track after the village and while there is no entrance fee to enter the park itself -- it’s run by the Forestry Department rather than National Parks -- you will have to pay 150 baht for one of the guides with lamps, for up to three people, who will be waiting in the car park. For safety reasons you are not allowed inside the cave without a guide. At certain times of year it may be necessary to access the cave by raft and even during the dry season you may need the use of a raft to cross the river once inside the cave. A return rafting trip through the length of the cave is 400 baht or raft one way and walk back is 300 baht and 15 minutes of leg work. A maximum of three people can use the raft at one time. All money paid here goes to the Shan villagers, who also construct and maintain the bamboo ladders and walkways in the caves. Browse our independent reviews of places to stay in and around Soppong. Read up on where to eat on Soppong. Check out our listings of things to do in and around Soppong. Read up on how to get to Soppong, or book your transport online with 12Go Asia. Planning on riding a scooter in Soppong? Please read this. See below for more sights and activities in Soppong that are listed on Travelfish.org. Where are you planning on heading to after Soppong? Here are some spots commonly visited from here, or click here to see a full destination list for Thailand.